A delightful activity book specially designed for sharing with young children during the holidays. Activities include paper ice-cream cones, a printed sandcastle and a paper plate sunflower. As well as being fun, the activities help develop important skills such as hand control, coordination and concentration. 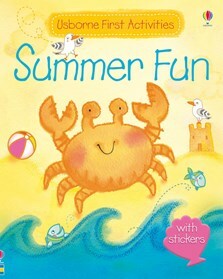 A brand-new book of fun activities to share with preschool children during the summer months, such as how to make paper ice-cream cones and a paper plate sunflower.